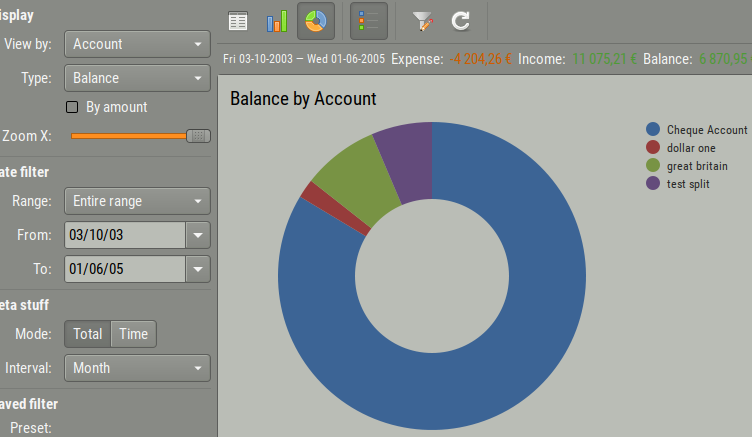 The balance report only allows to display the balance of each or all account vs. time. 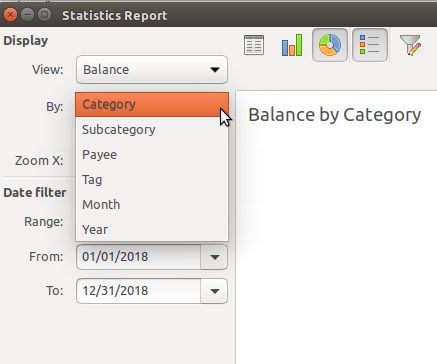 The Statistics report only allows to display the current balance by Category, subcategory, Payee, Tag, Month and Yea, but not by Account. It would be nice if there were an option in Balance Report or Statistics, to display the current balance of all accounts, in a pie chart, as a snapshot of all assets. Well I added Account into statistics for long, so you might be now. I mean select account, balance and pie chart. Well I added Account into statistics for long, so you might be able to do this now. HI Maxime. I'm not sure what you mean...In 5.2.2, in the Statistics Report > Donut, there is no option in the DD menu for "By: account"
Doh, not released yet, looked into my trunk 5.3 where I added Account. Thanks, that's great news! Will it be possible to include only selected accounts though? filter is still working as for now, so I would say yes.